5.75 points at 12 votes (rank 681). The "Gianna Sisters Construction Kit", or short the GS-CK is a German level editor for the game "The Great Giana Sisters" created by Boulder Dash veterans Sandy and Prof. Knibble. 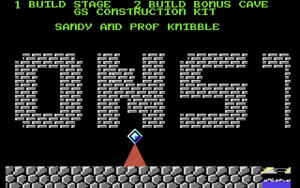 Sandy was responsible for the main programming, while Prof. Knibble added feedback and created the sprite coding part. GS-CK is completely menu driven and controlled by a joystick in control port 2. You can create normal stages and intermissions (bonus caves that can be entered from the normal stage). You can test your levels and play them at various states. You can also test normal stages as a final stage 33. You can build titlescrolls (like normal stages), but these cannot be tested with GS-CK just as playable stages. 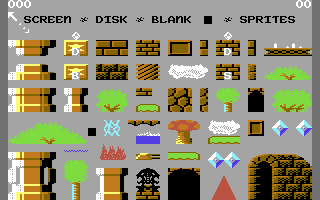 At least 7 games were created by GS-CK back in 1989 mostly by other Boulder Dash sceners like Pososcopi Waldkirch. These had been packed in-house as there is no level packer released for the editor, despite promises had been written on various "Future Writer" based letters among the GS-CK disk files. These letters also serve as instruction (help) files, and they were written in german entirely. GS-CK has two versions. The more exposed version (v1) doesn't start on its own, you have to load and then, reset "The Great Giana Sisters", when the game is fully loaded and uncrunched (at first when the titlescroll appears). After resetting, you can start the editor. The other, lesser known version is v2, which along with some of the created games haven't been released well until 2014. This version is only different as it doesn't need the original game to start, it loads automatically, and it's much easier to use. You can actually create v2 manually if you only have v1, and if you follow the steps of the main instruction file. You need machine code monitor cartridge for this, and well aware of the use of bank switching, transferring and memory saving. Levelpacker hadn't been finished, that has been confirmed by Prof. Knibble in a 2003 interview. When you enter the Titlescroll, you can choose between Building a Stage (Stage Bauen) by pressing 1, or Building an Intermission (Intermission Bauen) by pressing 2. To select an item from the above seen item table, move the cursor to the corresponding item and press the Joystick Fire button. The upper left-hand tip of the cursor is always decisive. The editor enters a 256x20 grid map, and it's starting screen, which is empty at first, and grey in color. In the editor, the map is split into 8 (0-7) parts, although there are a 6x20 grid overlapping in each part. You can switch on the "Raster" on the menu bar to see the grid and place the item precisely. By pushing the fire button 2 times, the item is set on the map. After the first click the selected item's upper left corner is loaded to the cursor position, meanwhile the menu bar temporarily disappears. One of the main drawback of the editor is that the selected item doesn't seem at this process, you have to place it blindly and have to memorize how to place each items. Using the actual grid with the Raster menu certainly helps the more precise placement. With moving the Joystick left and down during this process, the item you are setting can be duplicated in both the X and the Y grid. Moving the Joystick right and up doesn't duplicate the item though. You can however delete the item duplicates if you move the Joystick right an up. It works like an easy mouse dragging process, just a bit slower. The first set item can't be deleted though once placed, only with the "Undo" function in the menu bar. By scrolling to the right edge of the actual map screen the next map screen appears. Placing an item on the last grid position of the 8th (no. 7) grid screen isn't possible. The second click completes the setting process, and the menu bar appears again. The item's placement can be seen in a counter on the upper-left corner of the map. The power-up block can be set in each map screen only once, and cannot be duplicated, so one click is enough for its setting. The reason for this is to reduce unnecessary gaming situations, where you hit a block and two items pop-up at the same time. It's still possible (although not recommended) to set two power-ups that can appear on one in-game screen, as if you place a power-up block in the right side of a mapping part, and set another one on the left side of the next one. WARNING: If you save your map, and then reload it later, the editor won't notice the set power-up blocks. This means, if you want to retool your sprites and remove your power-up sprite in procession, the editor won't allow another power-up sprite to be set unless you place a brand new power-up block on the map! In map screen parts 0 and 7, power-up blocks can't be set as well. In part 0, the reason is because sprites can't be seen in the game at the starting area, and the power-up blocks are useless without a corresponding sprite. The big bush 1 also can't be set in part 7 for unknown reasons. If you leave the map in part 7, selecting the big bush 1 gives a flickering error sign. Exit By selecting Exit or Ex, you can return to the item table or to the next higher menu. It can be used in "Set Sprites" as well. 0-7 To move to another map screen, click the corresponding icon on the menu bar. The number of the selected map screen is displayed in a different (red) color. From the item table you always get to the last selected map screen. Raster An important feature that always had to be set on for precise item placement. It's the 256x20 point grid, which simplifies the setup of each items. Cont The "Cont" is another important and useful function, as it's used to simplify the setting of the main floor or ceiling, and should be used when you build the basics of the stage. After selecting "Cont", a yellow screen frame appears, and no matter where you place the selected item, or how much you drag it, by second click the item appears from start to end of the map at the selected Y position. Don't use "Cont" after your stage is an advanced state! WARNING: The big bush 1, the power-up block and the exit house can not be used with the "Cont" function. Zeit (Time): With "plus" or "minus" the start timer can be increased from 101 up to 191 by 10 second increments. If you modify the timer and later save the map, the map will use the modified timer at later reloads! Stage 33: As Dragon and Spider react in Stage 33 with a changed animation (following Giana), you can select this to test your last level of the game. It uses green screen frame during selection. A selection is only possible if a large diamond is set to the end of the map! The testing use the castle music if you play your level as stage 33. Nichts (No bonus start): Basic test mode. You have two lives for testing the map, but if you can collect 100 diamonds in the map, it can be increased. !! !WARNING: There is a game bug as if you finish a stage 33 playtest with the editor (reaching the diamond), and next time you playtest another map, with dying the editor can enter a black screen!!! However pressing the RESTORE (Page Up) button anytime, the game returns to the selection screen, so it's not a permanent freeze. Bonus: You can select power-ups to start the map during testing. After dying, you won't lose your power-up. Farben (Colors): After selecting the color to be set (used with a black screen frame), the cursor disappears and you can use left and right with the Joystick to select the color. Second click confirms the color. There are 3 types of colors: HFARBE as background color (standard is grey, although light blue and black are more preferable for the stages), "TFARBE1" and "TFARBE2" as foreground colors. Recommended use of this to use a lighter version of "TFARBE2" of the same color as "TFARBE1". Brown and light brown are standards for overworld stages, while more interesting color schemes can be used for black cave and castle stages. Wolken (Clouds): You can choose between Ein (clouds on) or Aus (clouds off). The clouds can only be displayed in the test run because they lie in the area of ​​the menu bar. Warp: A hidden warp block can be set. Unlike other bonuses, this will be used in the item selection counter and works the same way as an item selection. Unlike in the game, when a cheat code is used, the warp is W sign here, not a yellow strip. WARNING: Warp destinations cannot be set with the editor. It's a missing feature which only can be used with a levelpacker, which was never finished. This time, hitting the warp leads you to the fictional stage 5. With the Disc (Disk) menu, you can load or save a level with all parameters (including the modified timer) except in-game music and warp destination, which are not part of the program. During saving, you can add names to your stages, and you can even rename them with the program later. Along with load, save and rename, delete (DEL) function is also part of the Disc menu. In all of the 4 processes during entering the file name, the screen flickers, and the last used music bit is played behind. The characters "S" for Stage and "I" for Intermission (bonus cave or treasure chamber) are pre-programmed by the program from the name and can not be modified. However you are not supposed to enter "S" and "I", when you load a stage or an intermission. With Directory only the loadable files appear to simplify process of the map search. It is displayed in pages with 16 entries. Click on "Page" to see the next entries to be displayed. If you entered the program for stage building, only the "S" files, and if you entered it for intermission building, only the "I" files will appear for loading. All disc functions are checked for read and write errors, like a non-inserted disk. A drive that is not switched on however, leads to the program crash! With the REN function, as you can rename your own stage by typing the NEW name at first, and the OLD (existing) name at second. If you enter a wrong name, an error sign flickers. !! !WARNING: When you modify your stage and intermission files outside the program, like with D64 editor for emulators, be aware that you have to add empty spaces after the name to the end of the filename. If you won't, even the fully functional levels will be failed to load with the editor!!! Neu (New): After a security query, the whole game ram is deleting and you come into the titlescroll again. Schlucht (Rift): The rift of the ground is selected. It's like an item placement (also added to the counter), but unlike items, it's partly an empty field. Duplicating the rifts can look like a stalagmite. Löschblock (Deleting block): It's the plain empty field (blank) of the program. It can be used for multiple purposes, including making less natural looking rifts, but be aware, that it also adds to the counter, so it's not truly deleting the set items, and it should be used for this purpose only if you want to delete an older item. Use Undo function for proper deletion!!! Unbesiegbare feinde (Unbeatable enemies): Elephant (new enemy created for the editor as its replace the Yellow Stamp), Worm, Spiny, Ball, Fish. To select an actual sprite, press fire on Joystick. You enter your familiar map that is the same as when you place an item. Move the sprite with the Joystick (tip of the cursor is still decisive) and enter the map screens 1-7. No sprites can be set in screen 0. In the menu bar you can find the point "S" instead of the "0", with which you can come back without into the sprite table. The editor use a smart restriction of 4 sprites per screen (which screen is not the numbered map screen, but in any screens of the game). This restriction is needed because the program doesn't allow more than 4 enemy sprites in the map. 3 others are occupied for Giana, and 1 other for her dream bubble. In the original game, many levels don't respect this restriction, and some sprites cannot or rarely can be seen (like 2 Fishes in the end of stage 22). Sprites can only be set from left to right! If you want to insert a sprite, you must undo all other using "Undo" to the right of it. Note, that this is another game restriction. Random horizontal orders renders all sprites not in the row disappear in the game. Notable example of a Blue Stamp in stage 21 of the original game. With the above restrictions, you can only place the sprite, when it uses its original color. You can't place them, if they are black colored. When you try placing them in an "unauthorized" area, the frame flickers. 4 sprites per any in-game screens makes the rest of the in-game screen unauthorized. All areas left from the last sprite is unauthorized as well. Unlike items, it's possible to add sprites into the menu area (first 6 lines). You should select "Leiste", and the whole menu bar disappears until you place your sprite!!! The sprite counter is in the upper right corner. In each stage, only 20 sprites can be placed. The original game has levels that used more, but most of those sprites don't appear in-game. In each stage you can only use 1 Sprite, 1 Dragon, 1 Elevator and 1 Big Diamond. Again, game limits. The Big Diamond and the Elevator can only be placed in the 8th (no. 7) grid screen, and the Dragon or Spider bosses can only be placed after the middle of screen no. 6! If you place any of the 4 big sprites, you can't place anything after/right to them! Exception is the Big Diamond, which can be placed after the Dragon and the Spider. Not necessarily a stage 33 feature, but it's recommended only for stage 33 as the Big Diamond ends the game. If you want to place a Big Diamond outside Stage 33, you have to provide a way to avoid it by setting an exit or warp before it. The game mod "Furry Knibble Girls" uses fake Big Diamond in stage 13, but warping away is possible. Because of sprite limitations, the Big Diamond can be seen as 4 small diamonds in the map if it shares the same screen of a Dragon or Spider. In the game, the boss awkwardly disappears when the Big Diamond appears on the right side of the stage. Bosses with Big Diamonds behind them follow your position horizontally. They are more dangerous before the awkward disappearance. Keep in mind that Giana doesn't need to touch the Big Diamond, the game ends when she is right above it. This trick had been used in some of the game mods. Selecting non available sprites in the sprite table flickers the frame screen, which is the standard error sign. The only non available sprites are the 4 big ones, if you place small enemies 1 screen earlier than the last available grid position. Power-up sprites can only be used with a Power-up Block. If no such block is available, the error sign appears. Note, that the editor doesn't recognize the power-up blocks of reloaded maps, which is a small bug of the game. Giana's sprite is different as it's not used as the other sprites (no limits, no left-to-right rule, no counter). When you select her, you have to place the starting positions only. Once in screen 0 and once in screen 3 (checkpoint). Out of the sprites, the Elevator, the Ball, the Fish and the Blue Stamp have fixed vertical movements. The Dragon's and the Spider's movement is also fixed, although not vertical. Spiders can run out of the screen's left side, and later reappears on the right side. None of these enemies are sensitive for gravitation, so you can place Balls or Spiders when they can "float". Be aware of this when create your stage! The Owl, the Lobster and the the Eye use the same game code. They fall into pits and move slowly. The same goes for the Worm, the Spiny and the Elephant, except they are not beatable. Dragons, Spiders and even Elevators can be shot with multiple (10-15) dream bubbles. Don't try it with the Elevator, since it's essentially your exit. Bugs can catch dream bubbles. They are also fast and it's a gamble to jump on it. The Elephant is a new custom-made enemy which is not present in the original game. Unlike it's graphic, you can't jump on it without dying. There might have been a beta version of GS-CK which used the original Yellow Stamp since the first built game, "Gitty's Dreams 1" used it. The building of an intermission (bonus cave) is mostly like the building of a stage, although it has only one map screen, and has a stock Elevator at the right side of the screen (not buildable with the sprites menu). The elements like exit items, the big bush 1, the bonus line, the warp, and the power-up block can't be selected and used. Also sprites, timer and cont can't be selected and used. There is no sprite table for intermissions. The cursor is restricted to the right side of the Elevator. Colors (Farben) can only be selected through the "Bilder" menu, since during item placement, you Joystick cannot reach the menu points on the right side of the map (a minor bug). Clouds (Wolken) are actually available for Intermissions. Be aware of switching them on, as the game clouds will look dull after you exiting the bonus cave (when the clouds are switched on for the main stage as well). Testing is available. You have a stock map with a short solid ground, an exit house and a bonus line there only. Giana in the bonus cave is invincible! Neither harmful sprites can hurt her, nor the time out end the mission (albeit it will as soon as she goes up). When Giana fall into a bottomless pit, she will fall back from the top at the same X position. You only need 5 bonus caves for a particular game. You can have more bonus lines, but the caves in the game will appear in a sequenced loop. Even in the same level, if you die after entering a bonus cave, a different one will appear for the next try!! When you enter the actual stage's map mode, in the top line you can see the item counter (left side) and the sprite counter (right side) displayed. The menu is integrated in next lines (line 2 until 5). The lines below (6-20) are the editor area. In the game, the first 5 lines are part of the stage as well, although only clouds and sprites can be seen through those parts. Level elements like water, fire, bed of teeth, and crystals are animated in the editor, altough the sprites are static after being placed. Music and FX sounds can only be heard in the test mode. Since clouds cannot be seen during building (only in testing mode), a beginner error is to fill up levels from the cloud items from the item selection screen. It will however look dull in the game, since the selected clouds and the stock clouds are in different layers, one is parallaxing, the other isn't. Don't be afraid of using the border items for its intended function (as cave and castle wall borders). They are well used in the original game, but lesser in the GS-CK games and other hacks. Maps, especially castles with black background look incomplete without them. The water sprite is hard to duplicate, but it's possible. It cannot be used with the given duplication mode during setting the water item, but you have to place them manually, starting at the bottom, and then with setting a new water item at the top of it. It can cause more counter values though, so be aware of using this so often. Also, you can't swim in vanilla Giana Sisters, so a big pool might look awkwardly if Giana is falling in it. New graphic elements can be generated through overlaying the items. One of them is the stalagmite, which can be seen with duplicated rifts, but even more is possible like larger trees. Use the Undo function for removing an item instead of overwriting it with a blank or other item. It's better for RAM saving. Note, that undo always remove the last modification, so removing earlier modifications are more compromising. At the beginning you should use the "Cont" function for floors and ceilings, but later, it can cause overlaying problems. In the left upper corner of the menu, you can see the counter of elements (items left, sprites right), which is increased by setting or decreased by deleting (with the Undo function). The sequence of setting items or sprites is optional and can mixed. The experience is that firstly arrange the elements. In the titlescroll and in the intermissions sprites are not needed, although you can use any level for the titlescroll with or without sprites (like in Gitty's Dreams 2). A complete game has 32 normal stages, 1 final stage, 5 intermissions and a titlescroll. The final stage has an arbitrary big diamond, and boss monsters (dragon, spider) are following you until the diamond appears. Stage 32 is different to the rest of the levels only as the bonus line ends the levels instead of warping you to the intermission bonus room. You however, can't play levels as stage 32 in GS-CK. If you make a mistake during building a stage, the mistake is showed by flickering the screen frame. Most mistakes are documented in the sections above. You should test every stage one without any bonus power-ups. By losing one life after the half stage, it can halt your process in the game! The used RAM of each stage and intermission is variable. You should be aware of placing too much items or sprites in a stage. If you make more edits in a stage the counter get a red color. Now you must make less edits in other stages if you are planning a complete game (with a 3rd party levelpacker). Item counter get a red color for stage after 64 edits, for intermissions after 18 edits, and the sprite counter get a red color after 11 edits (placed sprites). Note that you can only have 20 sprites in a stage as well. Titlescroll has a default 110 edits in the Prof. Knibble written manuals, but as said, titlescrolls cannot be built separately. Stages, intermissions and titelscroll together could be have max. 2322 edits (items and empty fields). The edits of the parts of the game can be split optionally. Sprites could have max. 359 edits. This is RAM restriction. The original game has exactly 2322 items and 359 sprites. Choose the ground item first and place it with the Cont function. Set the background color in the menu with EXTRAS/FARBEN/HFARBE, then set foreground colors. Set the cloud mode (on or off) in the menu with EXTRAS/WOLKEN. Place the items first, then the sprites from left to right for each section and use the test-function extensively. Errors can be eliminated with the UNDO function. You should only proceed with the next step, if the stage is 100% playable. Set an exit to leave the stage. Set the start position and the second position of Giana! Give Giana a safe place! The complete stage must be tested without bonus power-ups. Use <Save><Disk> to save the end result to disk. That does not make sense in a level editor. The Joker: "Great level editor with small weaknesses and a big deficit: no levelpacker!, to produce a stand-alone game. So I decided, to program a levelpacker for Windows." Sprites can only be placed to the right of previously placed sprites. As said in the description, at least 7 Giana Sisters games had been created in-house shortly after the "Gianna Sisters Construction Kit" release in 1989 by using the editor. The editor's limitations, like the 4 sprite per map rule (which is not present in the original game) can be seen in the games' levels. The first, and the easiest levelpack, which - unlike the others - use the original yellow jumping enemy instead of the elephant. This means the pack might have used a beta version of the editor. Also this pack has some notable differences to the rest, as it has the original high score list and ending, and the original music sequence as well. Generally speaking, Gitty's Dreams 1 is probably the least ambitious pack, with questionable and somewhat amateurish design here and there. The followup of Gitty 1, and was often falsely called as Giana Sisters 2 in C64 magazines and between sceners, as the author Gitty's name can be misleading. This pack use a different music sequence, which had been used in all the other packs as well, no matter if the music fits the actual stage theme or not. With that said, this game introduced the hidden soundtrack (in the rather iconic stage 10) created by Chris Huelsbeck to many gamers. The pack also used the final version of the editor with the replacement elephant sprite, also the 10 lined high score list and the ending had been changed as well. 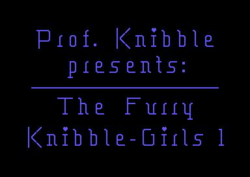 There is no hint for the level breakdown of the 4 different authors, although Prof. Knibble levels are easy to spot since they are different, and much closer in look to "The Furry Knibble Girls". These levels allegedly are stage 10, 14, 18, 27, 28, 31, 32 and 33. This is probably the most well-known levelpack made with GS-CK, despite not being the most ambitious one. A large improvement in leveldesign over the Gitty titles, this one is created by the Boulder Dash legend. There is no indication of a followup of this game, not even in the letters and the loading intro screens of the later games. Power Sisters 1 is largely based on crystal hunting, which can actually result lethal situations. Even farming can be used with warp zones between stage 14 and stage 17. The first (and probably inferior) title created by Frankie (whose nickname is also somewhat misleading), who warns the players that the two Frankie games are made for pros only! The first Frankie game - like Power Sisters - is based on crystal hunting, you need some farming techniques (like in stage 17) to finish the game. The second Frankie game, and probably the most difficult one created with the GS-CK. It's extensively based on power-ups, especially the clock and the waterdrop. There are many stages, which use badly placed fires, and having a waterdrop is important to finish the game. Also, this game has one of the most annoying levels (stage 27) ever made for Giana Sisters, as you have to micro manage through stalagmites without falling in a bottomless pit. Possibly the most ambitious, but at the same time, a rather obscure levelpack, since it was only released in 2014 by Philipp Staender in the original uncrunched format. This one use the same style seen in the selected levels of Gitty 2, and largely based on trial and error type gameplay with some mean and unexpected dead ends, easy-to-hit warps that throw you back levels, some interesting puzzles (ie. how to end stage 23) and probably the hardest stage (33) made by GS-CK. Unlike the Frankie games, this one is more learnable and rely less on pixel precise platforming. The last known title, a return of the lesser ambitious Gitty style in this really obscure title released in 2014 by Philipp Staender. Again, no level breakdown from the authors can be seen, but some different elements from Gitty 1 and 2 are recognizable in the game, like the weird crytal and spike formations. It's not the hardest game overall, but it has 2 extremely nasty, and not properly tested puzzles (one at the start of stage 2 with spikes, and the other is at the end of stage 12 with a fire), which indicates that this game is a bit more rushed, and the focus of the authors might have been shifted to something else by this time. It's still a fully functional, not broken game, although said puzzles can be game stoppers. There are some indications of a - probably final - game by the GS-CK, and it's called "Furry Knibble Girls 2". Philipp Staender has a messed up editor file on his site with the title "Knibble Girls 2", but it had been hinted in "The Gitty's News" intro screen as well. It's probably a permanently lost title by now, but it also might have been just an unfinished plan as well. No official cover released for this program. This page was last modified on 30 June 2018, at 23:55. This page has been accessed 6,533 times.